Gyrokinesis classes are an important component of Juliu Horvath’s methodology. Class begins with self-massage and simple breathing patterns that stimulate and awaken the senses. It then progresses through a series of spinal motions that mobilize the spine and pelvis through arching, curling, bending, twisting and spiraling. These movement patterns are repeated on other areas of the body to release the joints of the arms and legs in all possible directions. Connected together harmoniously through the use of breath, the postures begin to feel more like a dance than traditional yoga. The fluidity of the movements with their corresponding breathing patterns oxygenate the blood, stimulate the nervous system, and open up the energy pathways of the body. 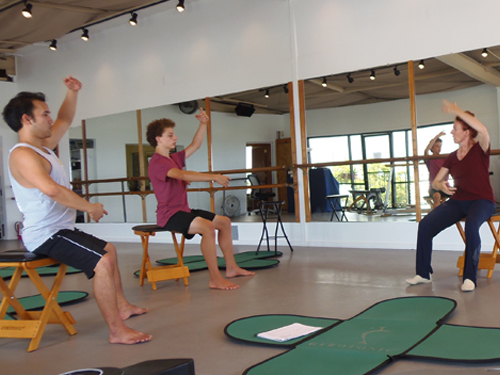 Some of the exercises are performed on low stools while others are done lying down, sitting, or standing. Gyrokinesis maximizes the flow of energy through the body leaving you feeling energized, balanced, and grounded.